The Space Shuttle Pavilion showcases the space shuttle Enterprise, the prototype NASA orbiter that paved the way for the space shuttle program. 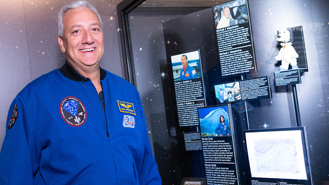 Seventeen dynamic exhibit zones feature original artifacts, photographs, audio, and films that immerse visitors in the science and history of Enterprise and the space shuttle era. 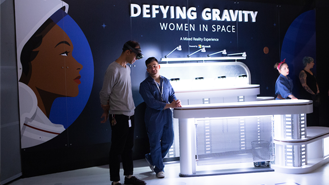 Experience the stories of previously unsung women in the U.S. space program brought to life through Microsoft HoloLens and hosted by a holographic Dr. Mae Jemison. Participants must be ages 13+ and are required to wear a HoloLens on their head. Take a virtual reality trip out of this world and visit the International Space Station! Experience what it's like to work, learn and live in the microgravity environment. Visitors enter the Pavilion through a soundscape featuring actual conversations between mission control and Enterprise pilots during flight tests. Exhibit displays explore the space shuttle design and highlight the talent behind the shuttle program. These and other experiences orbit around the exhibition centerpiece: the space shuttle Enterprise. Visitors can walk directly underneath the orbiter or visit an elevated platform for a dramatic view. Also located in the Pavilion is a space flown Soyuz TMA-6 space capsule, which invites comparison between these two spacecraft. In 2012, the Intrepid Museum successfully transported Enterprise to its new home in a series of carefully orchestrated movements. The journey started in April when Enterprise was flown from Washington, DC to JFK Airport atop a specially outfitted 747 NASA Shuttle Carrier Aircraft (SCA). Next up, the orbiter was carefully craned onto a barge for a multi-day trip from JFK to New Jersey and then up the Hudson River—passing the Statue of Liberty and the Freedom Tower—to the Intrepid Museum. On July 19, the Space Shuttle Pavilion, featuring Enterprise, opened to the public with much fanfare during SpaceFest, a five day public event featuring astronaut appearances, NASA displays, a concert and special movie screening. Unfortunately, when Hurricane Sandy struck the area on October 29, 2012, the Space Shuttle Pavilion was damaged, but reopened in July 2013.